It is this foundational truth that Paul has in mind when he tells us to think with sober judgment, each according to the measure of faith that God has assigned (Romans 12:3b). The renewed mind understands this truth and denies itself any possible reason to think too highly of itself. Since our position with Christ is a gift from God, we do not think too highly of ourselves. Because our salvation is completely undeserved—it is God’s mercy extended to us—we are set free from self-exaltation. Understanding the immense cost of our redemption—the sacrifice of Jesus—we willfully choose to surrender and dedicate ourselves to live for his honor and glory. Since God’s kingdom is eternal, we no longer attempt to build our own kingdom on earth. We purposefully live in the spiritual kingdom of Christ and dedicate ourselves to expand it. We choose to be slaves of righteousness as we purpose to live life for the glory of our savior, Jesus. The reality of such a life is that everything and everyone pales in comparison to Jesus. Every endeavor fails to measure up to the hope of glory that is found in him. So, we look away from self and others and look to Jesus. Blessing someone and praying for someone deals with more than our behavior; blessing and praying requires a movement of the heart. When we pray for those who persecute us, we pray for their good. In doing so, we reveal the goodness of Jesus enthroned on our heart. This is the kind of life and response to life that promotes the great glory of Jesus. We are called to bless our persecutors and not curse them, but we are also called to rejoice with those who rejoice, weep with those who weep (Romans 12:15). The Christian is to live radically different from those of the world. This comes from a heart that is fully satisfied with Christ Jesus seated on his throne there. We find our utter and complete satisfaction in him—our acceptance, significance and security is found in him alone. The source of this kind of glorious life of legacy faith is Jesus, and the means of this kind of life is humility. (Romans 12:16-18) It is with humility that Christ Jesus conquered sin, death, the grave, and Satan and his minions. He not only shows the way of Romans 12, but he is the way. Jesus blesses us by giving us abundant life today and secures our eternal life in paradise. 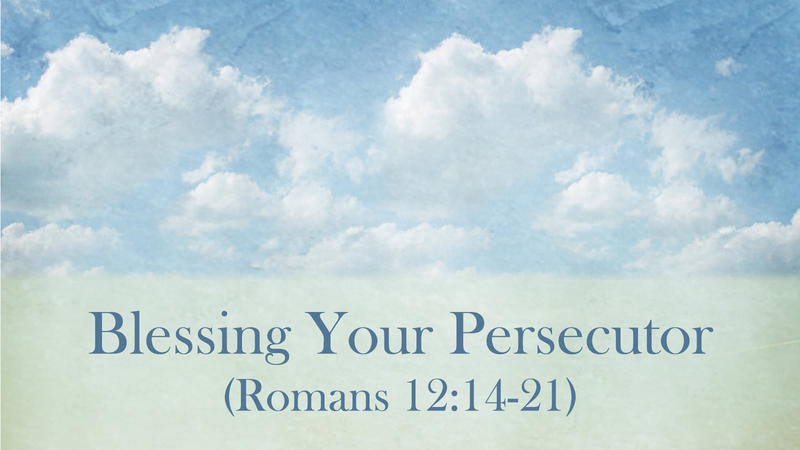 Persecution is a temporary issue; the promised rewards in heaven for the persecuted are eternal. If you are struggling with the demands of God in today’s passage, then press into Jesus and his unconditional love and sacrifice for you. What you mercifully and graciously have received, share with others, even your persecutors.